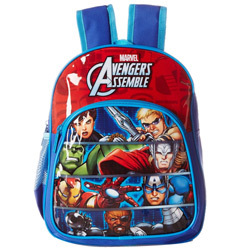 Gift online this Impressive Choice of Avengers Design Blue and Red Backpack and create an extremely joyful moment for your dear ones. Highlights of this Avengers Backpack are Butterfly Lock, 3 Specious Compartments, First Grade PVC Print at the Front, Colorful Puller with Brand Name, Water Resistant, PVC Piping N Full Webbing, made of Polyester Material, Side Pocket to Carry Water Bottle and Adjustable Strap. (Size-10.5”/4”/12”).